The Saturday and Sunday of the Bank Holiday weekend was the last in the 2017 racing calendar for the Royal Cork Optimist Class. Saturday saw the annual Lisheen Mines Team Racing Trophy run off on the Curlane Bank, and Sunday concluded the Cobbler League. 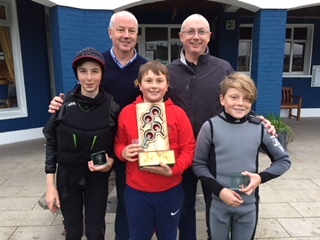 Rear Admiral Stephen O’Shaughnessy, Class Captain Ian Venner, winning team Eoin Horgan (Capt), Charlie Venner, Ben O’Shaughnessy. Our club performance coaching team of Michal Gryglewski, Peter McCann and Eoin Lyden spent time with the Lisheen Mines competitors, briefing them on the vagaries of team racing before heading out for some practice races. A full “S” course was used for both practice and racing, with teams of 3 competing. Nemo headed out around lunchtime and was the base for the post-training debrief as well as committee boat for the event proper. Conditions were ideal for team racing, with a steady 6-8 knots of breeze. Three round robins saw a tightly fought contest go to a tiebreak. James Dwyer Matthews, captaining Darragh and Rian Collins were defeated by the narrowest of margins by Eoin Horgan, Ben O’Shaughnessy and Charlie Venner. Jamie Venner & Kate Horgan’s team, with Harry Moynan and Shane Collins used a rolling substitute and came tantalizingly close to upsetting the leaders on more than one occasion. The extra hour in bed was most welcome on Sunday ahead of the final Cobbler League. A little more breeze plus some welcome sunshine greeted PRO Ciarán McSweeney. However, it was somewhat less stable than the previous day, showing 65 degree swings. 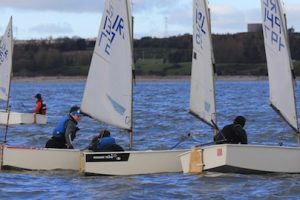 Nonetheless – three races were fitted in on a fantastic Autumn Day on the Curlane Bank. The fleet returned ashore to the usual hot chocolate and biscuits! 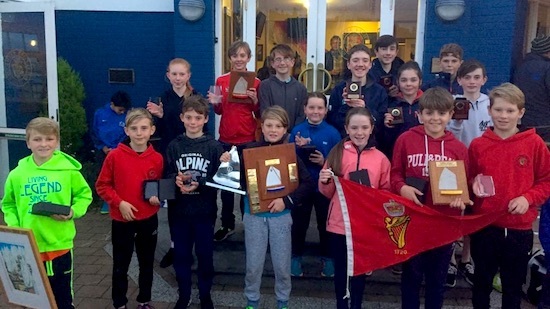 Many of our sailors are not done yet – our Performance and Club coaching programme continues throughout the Winter. Missing from the action this weekend were Anna Keal, Eimear McMorrow Moriarty, Harry, Simon and George Pritchard – away at an event in Vigo; Rory O’Sullivan and Harry Twomey at the Berlin Optimist Team Cup.